A milestone was reached Monday night at the 14th Annual Wrangler® Tough Enough to Wear Pink™ (TETWP) Night at the Wrangler National Finals Rodeo. The grassroots cowboy campaign has exceeded the 28 million dollar fundraising mark! The campaign was created in 2004 by Terry Wheatley, wine industry executive and matriarch of a professional rodeo cowboy family and Karl Stressman, former director of special events for Wrangler. The idea was to raise money and awareness for breast cancer by challenging rodeo competitors and fans alike to wear pink. 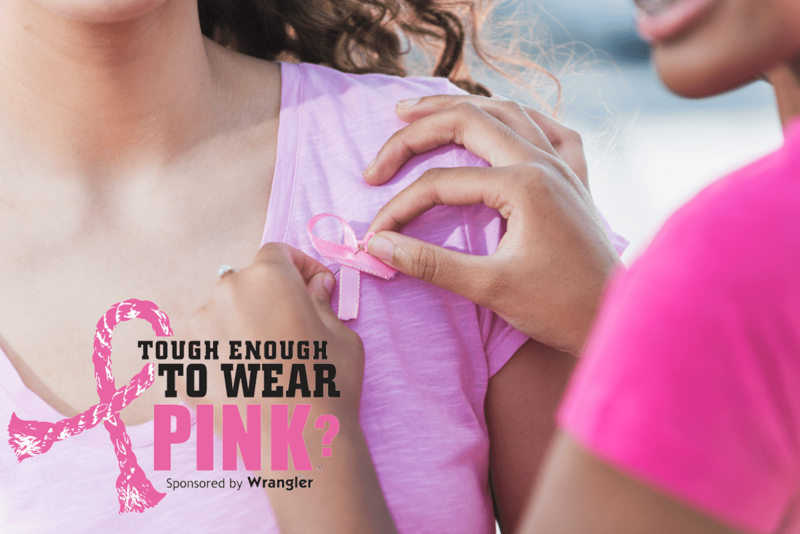 Wrangler is the title sponsor of TETWP and a portion of proceeds from everything sold within the Wrangler Tough Enough to Wear Pink merchandise collection goes back to the campaign fund. Along with the generous support of western businesses such as Wrangler, Montana Silversmiths, Las Vegas Events, Twisted X Boots and Purple Cowboy Wines, Wrangler TETWP relies on the hard work of regional rodeos and western events across the country. The strength of the TETWP campaign is that funds raised stay local to benefit the community breast cancer charities. It is the dedication of volunteers on the ground at local events that drives the campaign. “When we started the Tough Enough To Wear Pink campaign in 2004, we were overwhelmed by the support from the Professional Rodeo Cowboys Association, businesses, rodeo athletes, rodeo committees and western communities across the country. What seemed like an impossible dream to raise $50 million by our 20th Anniversary in 2024 is well on the way to becoming a reality,” commented Wheatley, herself a breast cancer survivor. A notable example of the grassroots efforts is #1 PRCA rodeo fundraiser, Cattlemen’s Days Rodeo in Gunnison, Colo. A long-time Top Five Wrangler TETWP fundraiser, the Gunnison community has raised more than 2.7 million dollars through the TETWP campaign to support the fight against breast cancer in their hometown. Founded 119 years ago in Gunnison Valley, Colo., Cattlemen’s Days Rodeo is considered the “Granddaddy of Colorado Rodeos.” Through the Cattlemen’s Days Rodeo, the community has shown its steadfast commitment to providing local funding for breast cancer awareness, prevention, education, support, breast screenings and equipment. Lacey Wheatley, Terry Wheatley’s daughter-in-law, is the Director of Wrangler TETWP and coordinates with rodeos and other non-rodeo organizations to create the pink-themed fundraisers. Wrangler® TETWP™ was created by entrepreneur and breast cancer survivor Terry Wheatley along with Karl Stressman to bring the sport of professional rodeo and the western community together to rally against breast cancer. Since its inception in 2004, Wrangler TETWP has empowered rodeos in the U.S. and Canada to focus attention on the need for a cure. To date, the campaign has raised $28 million for breast cancer charities, most of which stays right in the local communities. The grassroots movement has inspired other sports communities to mount their own Wrangler TETWP campaigns, spreading a message of hope and support that reaches beyond the rodeo arena to competitors, families and fans across America. For more information on how to help, visit www.toughenoughtowearpink.com. Wrangler® has been an icon in authentic American style around the world for more than 70 years. With a rich legacy rooted in the American west, Wrangler commits to offering unmatched quality and timeless design. Its collections for men, women and children look and feel great, inspiring those who wear them to be strong and ready for life, every day. Wrangler is available in retail stores worldwide, including brand flagship stores in Denver and Dallas, department stores, mass-market retailers, specialty shops, western outfitters, and online. A VF Corporation (NYSE: VFC) brand, Wrangler is backed by one of the world’s largest apparel, footwear and accessories companies with socially and environmentally responsible operations spanning numerous geographies. For more information, visit Wrangler.com. October 17 is Tough Enough To Wear Pink Day! Wednesday, October 17th is Tough Enough To Wear Pink Day! On Tough Enough To Wear Pink Day, we encourage you to proudly wear pink to show your support for breast cancer awareness and research. It also serves as a great reminder to check in on your friends and family to make sure they’re staying on top of their breast health with self exams, doctor visits and mammograms. Attend an upcoming Tough Enough To Wear Pink Day at a rodeo near you! Join the Gold Buckle Challenge! 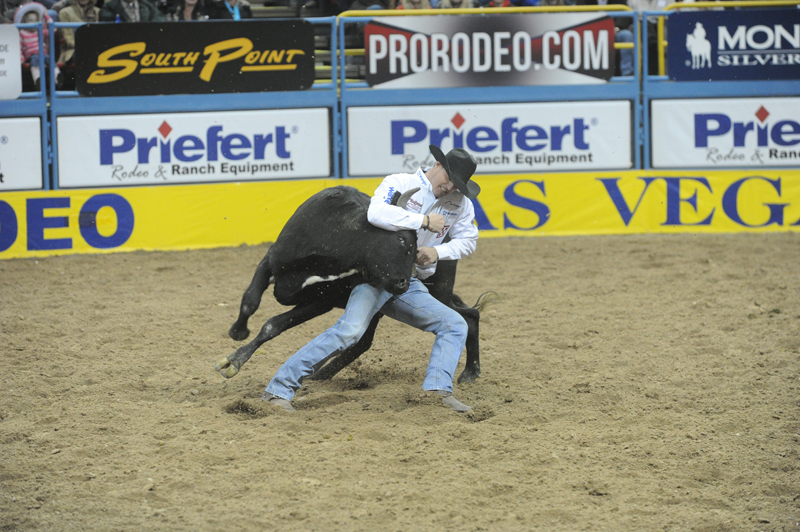 Enter for a chance to win Gold Buckle seats at the Wrangler National Finals Rodeo! There, you’ll witness the top rodeo athletes dressed in their finest pink gear compete on the biggest Tough Enough To Wear Pink rodeo night of the year. Annually, on Tough Enough To Wear Pink night at the Wrangler National Finals Rodeo, the Tough Enough To Wear Pink team recognizes breast cancer survivors and announces fundraising milestones. Enter here! Purple Cowboy and Clayhouse wines, both hailing from “Cowboy Wine Country” have teamed up to give back to Tough Enough To Wear Pink with a portion of the sale of each bottle. With every purchase of these Turn Paso Pink wines, you’ll be supporting the cause! 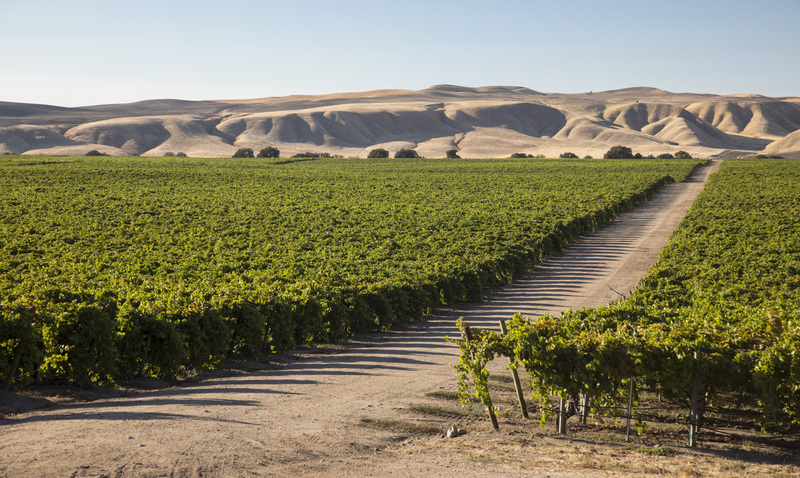 This October, we’re recognizing Breast Cancer Awareness Month with “Turn Paso Pink.” With Clayhouse Cabernet Sauvignon, also hailing from “Cowboy Wine Country,” we’ve teamed up to give back to Tough Enough To Wear Pink, the western community’s grassroots campaign to battle breast cancer. A portion of the sale of each bottle goes to Tough Enough To Wear Pink. Purple Cowboy creator and Wine Sisterhood founder, Terry Wheatley, is a breast cancer survivor and the Purple Cowboy wines she created have long given back to Tough Enough To Wear Pink. Terry co-founded Tough Enough To Wear Pink in 2004 with the idea that cowboys would wear pink at the Wrangler National Finals Rodeo on one night of the competition to raise awareness. The idea took off and Tough Enough To Wear Pink is celebrating its 14th anniversary in 2018. To date, $26 million has been raised at rodeos and western events to support families facing breast cancer, early detection and research. The goal is $50 million by the 20th anniversary. With every purchase of these Turn Paso Pink wines, you’ll be supporting Tough Enough To Wear Pink. Don’t forget to also mark your calendars for Tough Enough to Wear Pink Day, Wednesday, October 17! Wear pink to show your support! And starting today, you can enter for a chance to win a pair of Gold Buckle tickets to the Wrangler National Finals Rodeo through Purple Cowboy wines. Enter here! This Labor Day, we vow to do little labor, even when it comes to the backyard party we’re hosting. 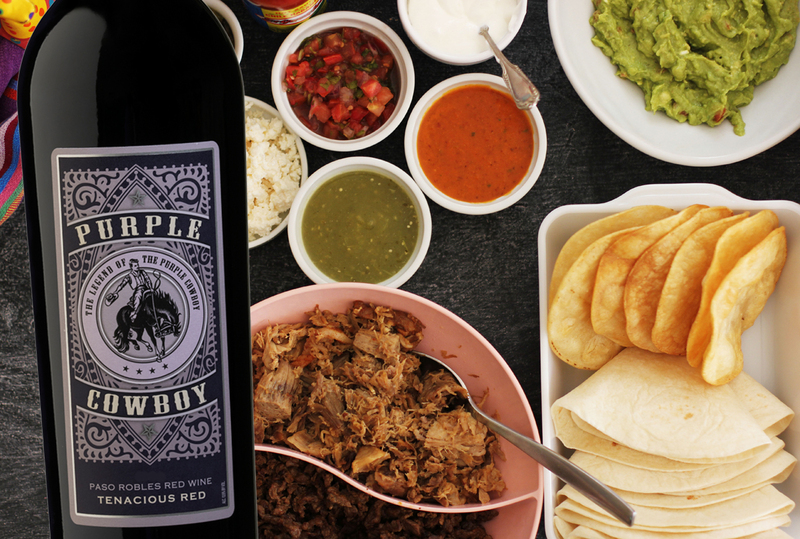 We chose carnitas as the main protein because we can make it well ahead of time, keeping our hands free, ready for a glass of Purple Cowboy! The traditional way to make carnitas is to take chunks of pork shoulder and simmer them in lard (aka. manteca) until they are achingly tender and sinfully rich and delicious. For those who do not want to go down this decadent path, here is an alternate version—just as yummy but a little more healthy-ish. 3 1/2 lb to 4 lb boneless pork shoulder roast, cut into two inch chunks. Heat oven to 275 degrees. Season pork with cinnamon, cloves, orange zest and black pepper & salt. Lay seasoned pork in single layer in a 13 x 9 baking dish. Add water, orange juice and bay leaves. Cover with foil and bake for two hours, or until fork tender. Remove pan from oven. Remove foil from pan. Raise oven temp to 450 degrees. Return pan to the oven and roast until all liquid is evaporated and meat begins to brown, about 45 minutes. Continue roasting, turning frequently, until meat is brown and crispy, about 30 additional minutes. Serve with warmed corn tortillas and your choice of green and red salsas. Other accoutrements: chopped white onion, chopped cilantro, Mexican crema or sour cream, hot sauce, radishes, pickled jalapeňos. Ditch the kitchen this summer. Instead, let’s fire up the grill and dig into dinner on the patio. Make your grilled meals shine when you open up a bold bottle of Purple Cowboy. Silly question… how do you take any grilled meat to the next level? Just add bacon. This recipe for Bacon-Wrapped Pork Tenderloin from Ally’s Cooking has summertime written all over it. Tip: skip your oven and opt for the grill this season. Put a spin on a classic favorite, like old-fashioned meatloaf by putting it on the grill. This Grilled Meatloaf recipe from Macheesmo will have you coming back for seconds. April is Tough Enough to Wear Pink Month! Each April, we’ve team up with our friends to turn the Western community PINK! Our goal is to spread the word about breast cancer awareness and research, designating April Tough Enough to Wear Pink month. We’ll be supporting our friends and family who are “Western Tough” and work tirelessly to support the Tough Enough mission throughout the year. One of those great friends, Twisted X Boots, will be sharing breast cancer survivor stories on their Facebook Page every day during the month of April. We’ll be reposting those stories to our Tough Enough to Wear Pink Facebook page. Please make sure you’re a fan, so you can follow along with us. A portion of each sale of Twisted X shoes supports Tough Enough to Wear Pink. Check out the TETWP collection at your local Twisted X retailer. And if they don’t carry these shoes, ask them to order some! We’ll also be sharing news about rodeos across the country and how they raise hundreds of thousands of dollars to support breast cancer awareness and research through special Tough Enough events. Also, this year you can enter to win weekly prizes through our “2018 Tough Enough to Wear Pink Pledge” campaign. All who sign up are also entered into the grand prize drawing of two Gold Buckle seats at the 2018 Wrangler National Finals Rodeo. Simply visit the “pledge” form. Fill out the required information and tell us how you pledge to support breast cancer awareness and research with at least one action this month. See you at the National Western Stock Show! We’re kicking off the New Year at the National Western Stock Show in Denver! 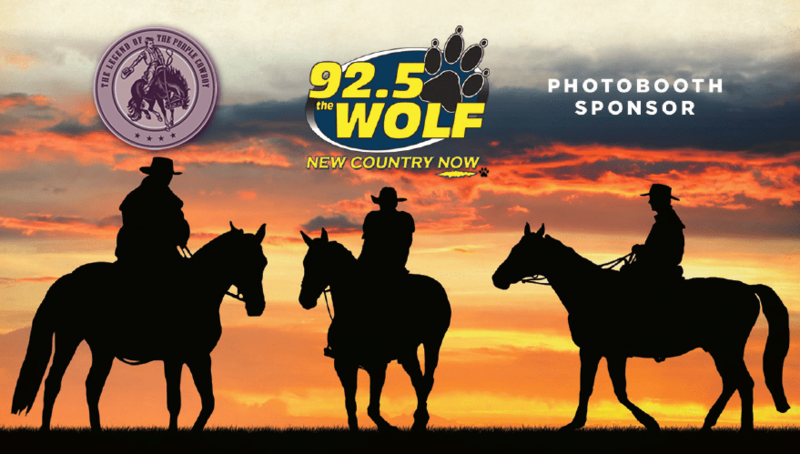 We’re so excited to join the fun that we’ve partnered with our friends at 92.5 The Wolf to offer complimentary photo booth prints. Stop by, take a photo and bring a memory home on us! 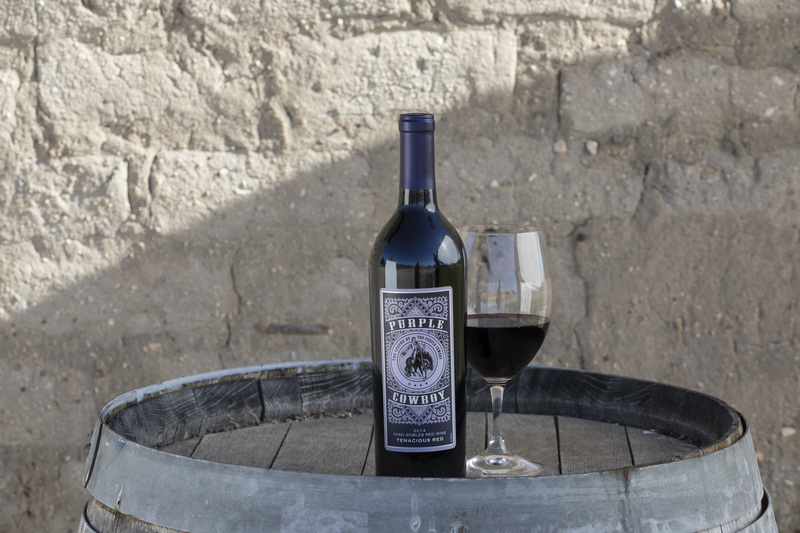 Then, pick up a bottle of Purple Cowboy Tenacious Red and Purple Cowboy Trail Boss Cabernet Sauvignon to enjoy at home. Experience the Stock Show fun this January 6th through the 21st at the Denver Coliseum (4600 Humboldt St, Denver, CO 80216). 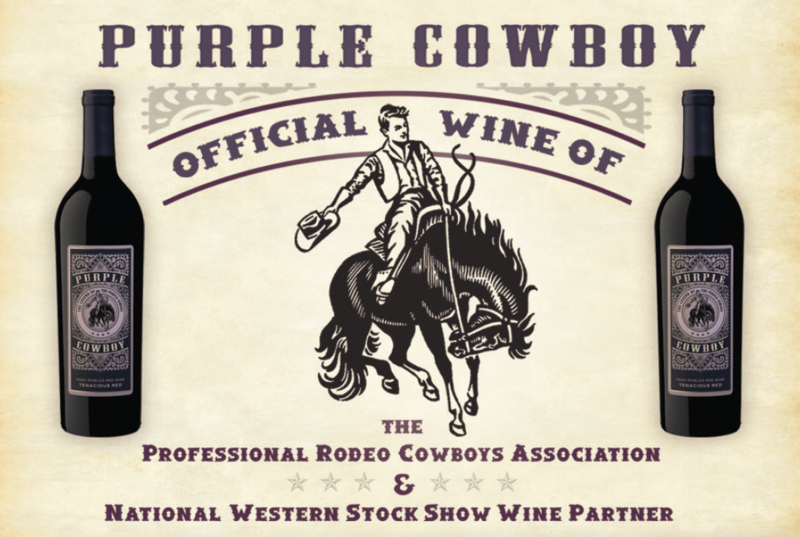 Purple Cowboy is the official sponsor of Tough Enough to Wear Pink, the Pro Rodeo Cowboys Association and National Western Stock Show wine partner. Since Purple Cowboy wines were created back in 2008 December means Tough Enough To Wear Pink Night at the Wrangler National Finals Rodeo in Las Vegas. Not only is Purple Cowboy the Official Wine of the Professional Rodeo Cowboys Association but the wine has been a long-time supporter of Tough Enough To Wear Pink, the western community’s campaign to fight breast cancer. The campaign was started by Terry Wheatley, creator of Purple Cowboy wines and Karl Stressman, formerly with Wrangler and now PRCA Rodeo Commissioner. They had an idea that the rodeo athletes should wear pink on one night during the Finals to raise awareness about breast cancer. The idea took off and today, Tough Enough To Wear Pink is supported by rodeos and western events across the country and dedicated corporate sponsors. Funds raised stay primarily in local communities to help families dealing with the disease. To date, $27 million has been raised. If you’re not at the rodeo and would like to support the work of Tough Enough To Wear Pink, please www.toughenoughstore.com where you can find merchandise and wearables that give back to the cause and tune in CBS Sports Network or ProRodeoTV.com to follow the action. If you’re coming to the rodeo, don’t forget the visit the Tough Enough To Wear Pink booth at the Thomas & Mack or check out Booth 671 at Stetson’s Country Christmas at the Sands Expo & Convention Center. And be sure to sport your pink gear on Tough Enough To Wear Pink Night, Monday, December 11. Join the Fight Against Breast Cancer! October is Breast Cancer Awareness Month, a special time to commemorate those we’ve lost, celebrate survivors and renew our promise to support breast cancer awareness and research. It also serves as a reminder to ourselves and loved ones to schedule a breast health check-up or mammogram. After you have that covered, join us in celebrating Tough Enough to Wear Pink Day on October 19. We’re asking our fans to show your support for breast cancer awareness by wearing pink and encouraging your household, coworkers and friends to do the same on October 18. We’ve also saddled up with our friends at Clayhouse wines through Paso Pardners in Pink. Purple Cowboy Tenacious Red and Clayhouse Cabernet Sauvignon, two delicious wines from “Cowboy Wine Country” have teamed up to give back to Tough Enough To Wear Pink, the western community’s grassroots campaign to battle breast cancer. A portion of the sale of each bottle goes to Tough Enough To Wear Pink. 2017 marks the 13th Anniversary of the founding of Wrangler Tough Enough to Wear Pink. To date, more than $25 million dollars have been raised through Tough Enough to Wear Pink, the campaign encourages competitors and fans at rodeos and western events around the country to wear pink to raise awareness and funds. It’s all made possible with the help of sponsors like Wrangler, Montana Silversmiths, Pro Rodeo Cowboys Association, Clayhouse and Purple Cowboy wines. Our goal is to raise $50 million dollars by the 20th Anniversary of Tough Enough To Wear Pink in 2024. Throughout October, Tough Enough to Wear Pink will be sharing breast cancer “Survivor Stories” collected over the past few months. We’ll announce the “Survivor Stories” grand prize winner of a trip to the Wrangler National Finals Rodeo and Gold Buckle seats at the end of October. Make sure you’re following the Tough Enough to Wear Pink Facebook Page so you don’t miss an update. And don’t forget to wear your PINK on October 19! Support Paso Pardners in Pink! This year, we’re recognizing Breast Cancer Awareness Month early with the start of Paso Pardners in Pink. We’ve joined forces with friends from Paso Robles in the fight against breast cancer through Paso Pardners in Pink. 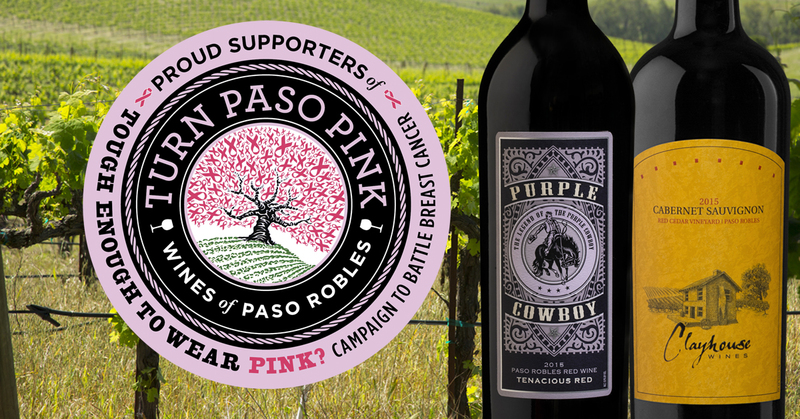 Purple Cowboy Tenacious Red and Clayhouse Cabernet Sauvignon, two delicious wines from “Cowboy Wine Country” have teamed up to give back to Tough Enough To Wear Pink, the western community’s grassroots campaign to battle breast cancer. Wine Sisterhood founder, Terry Wheatley, is a breast cancer survivor and the Purple Cowboy wines she created have long given back to Tough Enough To Wear Pink. Terry co-founded Tough Enough To Wear Pink in 2004 with the idea that cowboys would wear pink at the Wrangler National Finals Rodeo on one night of the competition to raise awareness. The idea took off and Tough Enough To Wear Pink is celebrating its 13th anniversary in 2017. To date, $27 million has been raised at rodeos and western events to support families facing breast cancer, early detection and research. The goal is $50 million by the 20th anniversary. A portion of the sale of each bottle goes to Tough Enough To Wear Pink. Don’t forget to also mark your calendars for Tough Enough to Wear Pink Day, October 18! Wear pink to show your support!